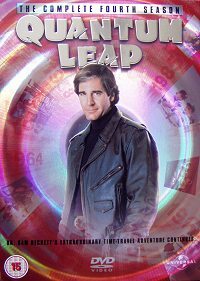 "A Kiss With History: Remembering Quantum Leap"
Series stars Scott Bakula and Dean Stockwell, along with creator Don Bellisario share stories about creating their groundbreaking series. 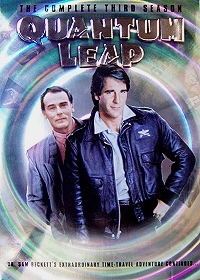 Scott Bakula shares a bit of trivia about each episode (guest stars, special effects & training). Running Time: 7 Hrs. 8 Mins. Although I'd have wished for some more language audio tracks to be included, the cover is very well done, they put a lot of effort into design and special features and everything else. Definitely worth the money! This DVD set was also released as a region 2 set in the UK (released November 8, 2004); and in Germany (released June 29, 2006) under the name Zurück in die Vergangenheit. The German version also contains the German audio tracks. Running Time: 17 Hrs. 40 Mins. I reckon I won't ever become a fan of double sided discs. I'd rather have a few more discs than ones I have to treat like a raw egg. The missing bonus material is another thing. 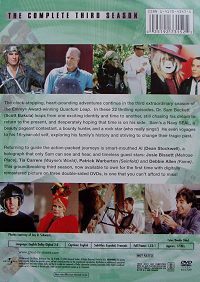 It's one thing not putting bonus material on a set, it's another promising it on the back cover and then not putting it there. More questionable, however, is probably the idea of replacing the original background sound. I really don't see what that was for. All right, it might happen that you don't get the rights for one or another song. But the music they replaced it with is a major, major catastrophe. If they had to replace it, couldn't they have found something appropriate? All in all, the box set leaves a lot to be desired. The most dreadful thing, though, is the replacement songs. They really spoil some of the scenes. Running Time: approx. 17 Hrs. 23 Mins. The box's exterior has positively improved. I think it was a good idea to replace that hard-to-handle fold-out design with single cases. 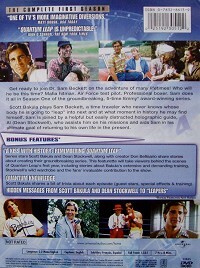 It was also a good idea to finally put introductions of the episodes on the back of each DVD case. 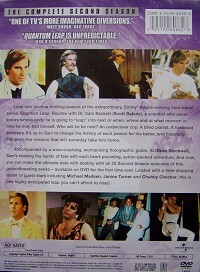 Though there are still songs that have been replaced, it is at least noted on the back cover - which it hadn't been on the season two set. And as far as I've been able to watch up to now, it hasn't been done at such crucial moments as in season two. All in all, the season three box is a lot more enjoyable than the last had been, but a lot of people - me included - are not very happy with the continuing replacement of the original music and lack of special features. That probably cost them a great number of potential customers. Season three was released in the UK, too (release date: December 12, 2005). Again, the music was not replaced and it contains one-sided discs. 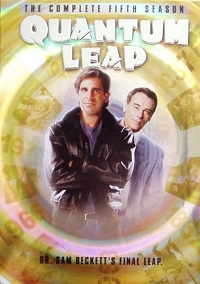 bonus episode: Season 5: "Liberation"
Running Time: 16 Hrs. 27 Mins. Although it is noted on the back cover, the continuous replacement of background music is annoying. Why can't they just leave it as it is? There finally is some bonus material, although I'd have found it more satisfying had they given some background information or included some interviews with cast or crew members instead of a season 5 episode most people will buy with the season 5 set anyway. But it is an improvement. The set still has single cases as season three, but unfortunately still double-sided discs as well. All in all, it's about as enjoyable as the season three set, but I wish they'd stop replacing the music. 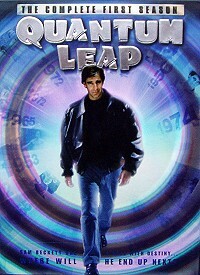 Season four was released in the UK as well (released June 26, 2006). Sadly, this time the music has also been replaced as on the US version. There are no subtitles on the discs either, not even English ones. Running Time: 17 Hrs. 8 Mins. Finally, ALL original songs are included!! It's hard to imagine without having seen it for yourself how much the music influences the overall impression, but it does. I'm really grateful they finally understood that and stopped replacing the songs. Though there are no chapter menues this time, I didn't particularly miss them. The bonus material (which is composed of nothing but a handful of blueprints) is not particularly numerous, but fun to see. The case is well done, although they still use those annoying double-sided discs. All in all, the Season 5 set is very much enjoyable, although one could have wished for a little more bonus material. 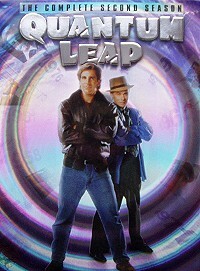 Season 5 was released in the UK on December 26, 2006. The music was NOT replaced! Regrettably, though, the blueprints were omitted and there are still no subtitles.